The only device designed for Galvanic Vestibular stimulation, from the leader in non-invasive neuromodulation. The Soterix medical Galvanic Vestibular stimulator is the clinical standard when precision and safety cannot be compromised. The Soterix Galvanic Vestibular stimulator is the only device specifically designed for Galvanic Vestibular stimulation. Soterix Medical is the leader in non-invasive electrical stimulation through engineering optimized and customized technologies. 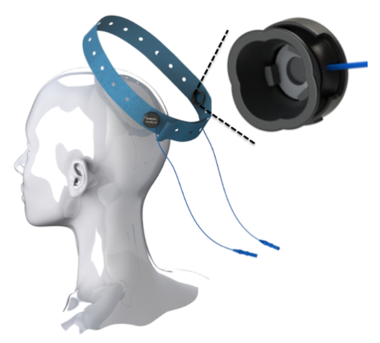 The Soterix Medical Galvanic Vestibular Stimulation (GVS) systems includes the first electrode designed for trans-mastoid stimulation, the first headgear to support mastoid electrode robustly, and the first stimulation with outputs, controls, and safety monitoring optimized for GVS. The Vestibular HD Electrode Holder is specially designed for consistent contact with the mastoid. They are designed to be used with HD-GEL that provides both electrical continuity from the device to the skin and ensures skin comfort. To further secure the Vestibular HD Electrode Holder, a unique Vestibular HEADstrap based on the Soterix Medical “BLUE” hypoallergenic, latex-free, elastic material, can be simply applied. 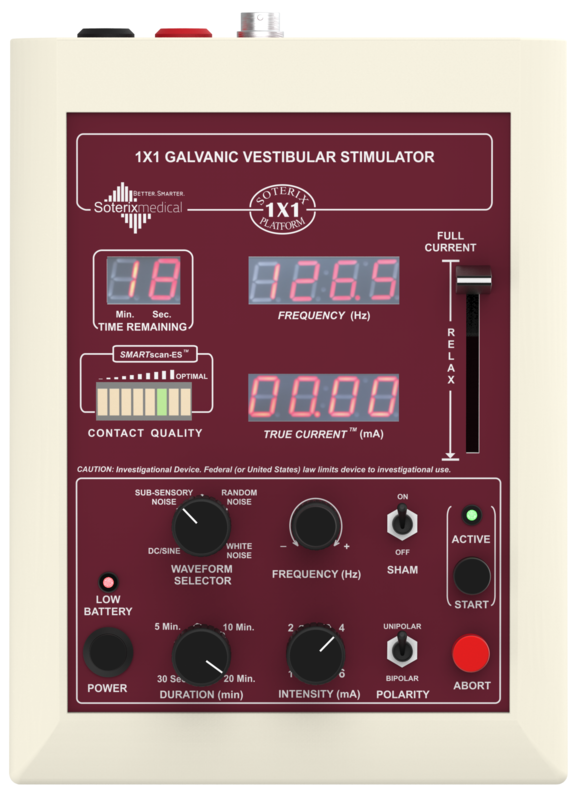 Finally, the Galvanic Vestibular Stimulator, based on the industry standard Soterix Medical 1x1 platform, is the only system designed for consistent and controlled current delivery, even at current up to 5.5 mA. Two stimulator models are available: 1) Galvanic Vestibular Direct Direct and 2) Galvanic Vestibular Oscillating Current which provides either Direct Current or and Pulsed Current stimulation. Unique accessories integrate with Soterix Medical Galvanic Vestibular stimulators. In developing state-of-the-art stimulators, feed-back from leading clinical centers was clear: GVS must be simple to program and stimulation status must always be apparent to the investigator. With easy-click control knobs to set stimulation duration and intensity, and back-lit status displays visible in dim or bright room light, the Soterix Medical Open-Panel™ design takes the guess work out of programming and monitoring stimulation. Galvanic Vestibular Stimulation (GVS) is a method of non-invasive electrical stimulation to effect the vestibular system and potentially change balance. The stimulus produces stereotyped automatic postural and ocular responses. Depending on how GVS is applied it can produce specific sensations that may be related to the anatomy and physiology of the vestibular apparatus, including the three semi-circular canals. The technology has been tested for decades for medical and non-medical applications. However, it was not until 2014 when Soterix Medical introduces the first Galvanic Vestibular Stimulation system that a stimulator, head-gear, and electrodes optimized for GVS was available. The Soterix Medical Galvanic Vestibular System is the most advanced technology available for reliable and tolerated GVS and the only system incorporating state-of-the-art electronic and electrode technology. One feature of GVS is the polarity specific nature of induced changes. The Soterix Medical GVS technology has two models, a Direct Current (DC) mode which produces sustained current and an Oscillating Model which may produce a cumulative change with each wave (the Oscillating Model can also provide basic Direct Current). The systems provide currents up to 5.5 mA which have been used to produce significant changes in perception but lower currents are better tolerated and may be effective when provided for a sustained period of time in producing neuro-plastic effects. The RELAX™ feature available on all Soterix Medical GVS devices allow dynamic titration of dose while SMARTScan™ provides intelligent read-out of impedance before and during stimulation. The technique of GVS has been used for a long time but the mechanisms underlying responses are not fully understood. Soterix Medical is committed to providing researchers and clinicians with modern and advanced GVS technology in support of rational advancement of science - because experimental reliability is limited by the quality of technology. Customized stimulators, head-gear, and electrodes ensure reliable contact and stimulation. Galvanic vestibular stimulation is the process of electrical neuromodulation of brain organs associated with balance. Targets include the nerve in the ear that maintains balance, which include two groups of receptors in the vestibular system: the three semi-circular canals, and the two otolith organs (the utricle and the saccule). Galvanic Vestibular Stimulation technology has been investigated over decades for both scientific and medical purposes, but the Soterix Medical GVS system is the first technology designed for robust and controlled stimulation. While the technique of galvanic vestibular stimulation (GVS) has been used for some time, and the effects robust and clear, the mechanisms of GVS remain under investigation. The stimulus produces stereotyped automatic postural and ocular responses. The mechanisms underlying these responses are not understood although they are commonly attributed to altered otolith output. It is assumed that that vestibular afferents from the otoliths and semicircular canals are affected similarly by GVS. The maintenance of a stable stance in humans (and animals) involves a range of sensor apparatuses including the vestibular system. 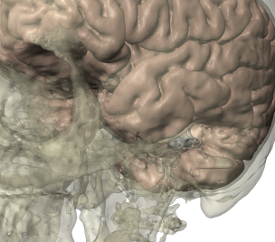 Soterix Medical GVS systems are designed to deliver direct current non-invasively to the vestibular system with electrodes placed on the mastoid bones. The Vestibular HD-Cup electrodes are designed to optimally interface mechanically and electrically with the mastoid process. One hypothesis is that GVS results in a continuous modulation of the firing rate of vestibular afferents, which manifests in a standing subject leaning in a different direction depending in the polarity of the current. Typically, subjects will lean towards the anode. However, the behavioral and potential therapeutic effects of GVS are subtler in postural sway and homeostatic response that in turn may lead to plasticity. The Soterix Medical GVS platform is the only system that allows controlled and reproducible stimulation, which is required to advance the science and treatment of GVS. The most advanced, simple to use, precise, reliable stimulator for Vestibular Neuromodulation. The Soterix Medical Galvanic Vestibular Stimulators were designed with inputs from clinicians and researchers, and is the only Stimulator designed specifically for this purpose. Available in two models (Direct Current and Pulsed Current), all Soterix Medical Vestibular Stimulator's have unique and industry leading features. The Soterix Medical GVS system is the most advanced and reproducible system for stimulation of the Vestibular system. Soterix Medical GVS system includes simple but robust headgear, high performance mastoid electrodes based on the exclusive High-Definition (HD) design, and an advanced current stimulator with unique features allowing for both acute and plasticity experiments. Current Controlled. DC or Oscillating Wave with adjustable frequency. Monophasic or Biphasic. Adjustable intensity. Peak current up to 6 mA. Real time adjustment of intensity (for experimental design or based on patient feedback) using RELAX &dash; option available for bench-top device. 4 duration settings (up to 20 minutes) with count-down clock display and easy-access ABORT option. 4 current settings (up to 6 mA) with unique power-management and automatic current reduction when poor contact conditions are detected. Single device can be configured for two electrode (one anode and one cathode), three electrode (two anode and one cathode or two cathode and one anode), or four electrode (two anode and two cathode) modes. Sham waveform validated with our electrodes for robust blinding of subject. From pre-stimulation set-up, to during stimulation monitoring, to post-stimulation confirmation, the Soterix Medical SMARTscan™ feature provides an intuitive and clear indication of electrode contact quality. Use the SMARTscan™ during set-up to adjust electrodes and head-gear for optimal fit. During stimulation, SMARTscan™ provides a constant indication of electrode quality and can be monitored during adjustments (e.g. addition of gel to drying electrodes). After stimulation, SMARTscan™ confirms a successful trial. Because “resistance” is not meaningful for GVS, SMARTscan™ was developed by Soterix Medical engineers to provide clinical investigators with a simple to read indication of contact quality. Clearly indicates the actual current supplied at the moment – option available for bench-top device. What other devices promise, the Soterix Galvanic Vestibular stimulation delivers. The back-lit display can be monitored at all times: pre-stimulation, stimulation, ramp-up, ramp-down to confirm status of current intensity delivered. 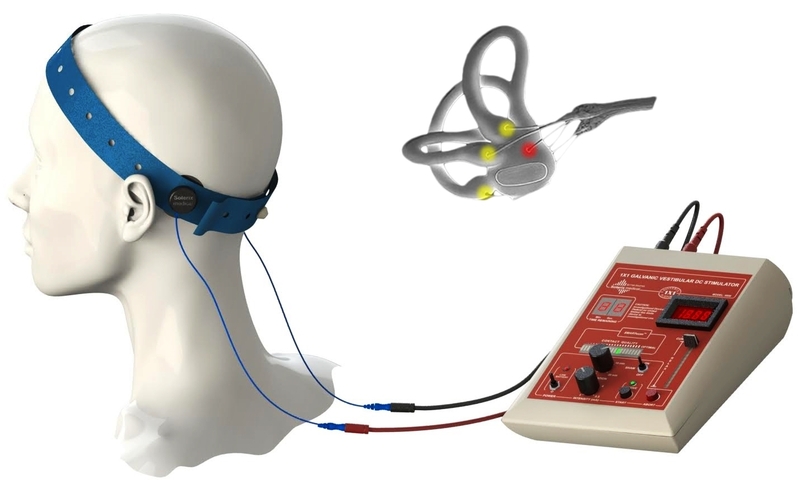 May be used to supply a very weak current prior to Galvanic Vestibular stimulation to help condition the skin – option available for bench-top device. TICKLE™ may be used to both condition skin prior to Galvanic Vestibular stimulation and for naïve subjects who are anxious about stimulation. A custom on-off waveform pattern generates mild and brief sensation under electrodes. Allows the clinician to use a simple sliding bar to transiently decrease the current from the pre-set value, for example, based on subject feedback. – option available for bench-top device. Based on feed-back from leading clinical centers, Soterix Medical exclusive feature RELAX™ accommodates subjects who may be anxious when stimulation is initiated or during the course of stimulation. The RELAX™ slider may be adjusted from full to reduced intensity based on subject sensation without interrupting or aborting stimulation. Allows the clinician or administrator to set dose and use limits. Allows supervision of stimulation sessions remote from clinic – option available for hand-held device. A simple feature that minimizes dropout in double-blind clinical trials - option available for hand-held device. Sometimes trivial issues require stimulation interruption or adjustment. Rather than abort a session which can result in subject exclusion or data confounds, the PAUSE feature was developed in collaboration with clinical trial experts running higher-volume or longer duration trials. For both automatic (under SMART scan) and user initiated PAUSE, this exclusive feature intelligently avoids breaking sham even in double-blind trials. 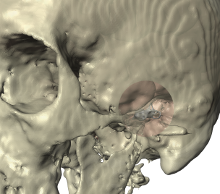 A simple but optimized design to properly position and reliably hold the Vestibular HD electrodes in place. The one-size-fits-all strap adjusts around the forehead and under the inion, proving a secure fit. Minimal material maximizes subject comfort. The Vestibular HEADstrap includes holes that function to both fit the Vestibular HD electrodes and the plastic joint provided with the strap. When positioned correctly on the head, one hole in strap overlaps with each of the mastoid processes, which is where the Vestibular HD Electrode Cups are inserted. The strap is based on the Soterix Medical Elastic Fastener Blue technology providing unmatched , comfort, durability and tolerability. 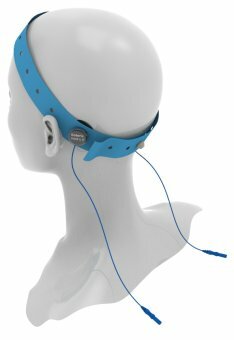 One (1) Vestibular HEADstrap is provided in the basic kit with each stimulator. 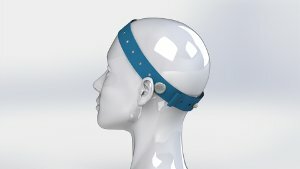 Based on the unique Soterix Medical HD-tDCS technology, the Vestibular HD Electrode Holder are further enhanced to accommodate the needs of Galvanic Vestibular Stimulation using either Direct Current or Pulsed Current waveforms. Two (2) Vestibular HD Electrode Holders are provided in the basic kit with each Stimulator. Each Vestibular HD Electrode Holder is positioned over the mastoid process and held in the place by the Vestibular HEADstrap. The Vestibular HD Electrode Holder is designed to accommodate Soterix Medical HD-tDCS electrodes. Ten (10) HD Electrodes are also provided in the basic kit with each Stimulator. Similar to Soterix Medical HD-tDCS technology, the Vestibular HD Electrode Holder and HD Electrodes provide superior comfort and reproducibility. High capacity gels that fills the Vestibular-HD Electrode Cup and provides contact between the HD-electrode and the skin (mastoid process). The HD-Gel maximizes tolerable stimulation. One (1) tube comes in the basic kit with each stimulator. When used with the Vestibular-HD Electrode Cup, the HD-Gel has optimal electrical conductivity, thermal conductivity, viscosity, and phase drying for reliable contact conditions for the entire duration of the intervention. Soterix Medical provides a range of accessories designed to work with Soterix Medical Galvanic Vestibular stimulators and optimized for clinical ease of use and safety. A basic or complete kit can be provided with each Soterix Medical stimulator. Replacement components sold separately. Accessory quality including electrode, electrolyte, holder, and head-gear fundamentally determine tolerability. Lack of control of sensation compromises reproducibility and safety. The importance of secure electrode positioning is amplified in experiments where the subject may be moving, as occurs in GVS by study design (for example subject walking) or as a result of stimulation. The current flow through the head is determined by the details of electrode montage. Reproducibility requires a constant and stable placement of electrodes.